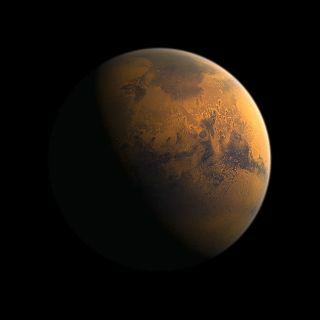 The craters of Mars appear in this artist's view of the Red Planet. Image uploaded March 11, 2014. Space fans who name Martian craters for a fee will not see those monikers considered for official recognition, according to the International Astronomical Union. The IAU, the authority that assigns "official" names to celestial bodies and surface features, will not legitimize any purchased names for Martian craters or other features, officials from the organization said in an announcement today (March 11). Although the IAU's statement doesn't mention Uwingu specifically, it seems directed at the Martian crater project. Uwingu officials, for their part, have stressed that the project seeks to select "people's choice" names, not official scientific ones, for Martian craters. And they're not happy with the IAU's criticism. "Once again, the IAU has overstepped its bounds as a professional society for astronomers. Uwingu is opening up the universe to the public and funding science by public participation in the process; the IAU is doing neither," Uwingu CEO Alan Stern, a former NASA science chief and the head of the agency's New Horizons mission to Pluto, told Space.com via email. "In fact, today's IAU announcement makes clear the IAU is against both, it seems, over its perceived threat to a monopoly it only has in its own universe," Stern added. "We've gotten almost as many members participating in Uwingu in the past 2 weeks as the IAU has after a century. I think people clearly see where the future is, and the past." Uwingu officials are not attempting to garner approval from the IAU, instead opting to create a "people's map of Mars" using popular names for the craters, Stern said when the project began. The 15,000 Red Planet features with IAU-approved names are not available for re-naming within the project's map. Uwingu names are assigned on a first-come-first-served basis and will not be deleted unless project officials decide that the names are offensive or profane. The money made from the naming initiative will help fund space exploration, education and research — Uwingu's chief purpose. "When I registered a name on Uwingu's Mars crater map — 'collectSPACE' in celebration of the space history enthusiasts who read collectSPACE.com — I wasn't under any misconception that it would be accepted by the IAU or become official," said Robert Pearlman, editor of collectSPACE.com, a space history-focused news website and Space.com partner. "Though I am often critical of commercial star naming or lunar land offers, Uwingu's stated purpose of raising funds for space exploration and research grants seemed to be a worthy cause. Their crater map was just a creative way to fundraise." If people name every available Martian crater, Uwingu could raise more than $10 million. So far, people from 78 countries have named more than 7,000 craters as part of the project, Stern and Uwingu co-founder Mark Sykes wrote in The Space Review Monday. "I can understand why the IAU would want to make its policies clear, but there is also precedent for unofficial names being used colloquially on Mars," Pearlman told Space.com. "For example, the IAU officially named the 18,000-foot peak at the center of Gale Crater as 'Aeolis Mons.' NASA, however, often refers to the same feature as 'Mount Sharp,' for the geologist Robert Sharp, when describing its Curiosity rover's target destination." This is not the first time that Uwingu and the IAU have butted heads. Last year, the international organization leveled similar criticisms at Uwingu's exoplanet-naming efforts. Then, as now, Stern fought back hard. Space agencies and the discoverers of various cosmic objects can request naming input from the public with the cooperation of the IAU. In 2013, the two most recently discovered moons of Pluto were named through a free public vote. The IAU took the suggested names into consideration when designating the dwarf planet's natural satellites. Space.com senior writer Mike Wall contributed to this story. Follow Miriam Kramer @mirikramer and Google+. Follow us @Spacedotcom, Facebook and Google+. Original article on Space.com.